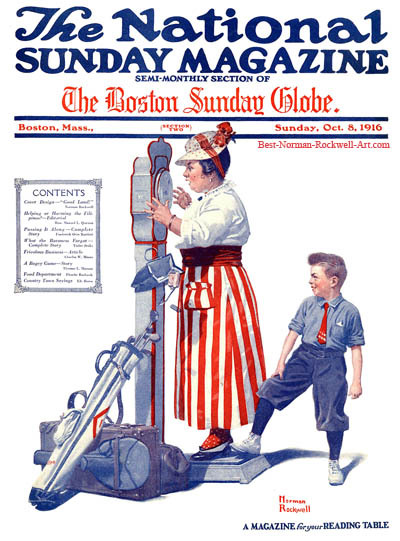 The New Baby, this Norman Rockwell painting, appeared on the cover of National Sunday published October 8, 1916. This is the only known cover illustration by Rockwell to appear on National Sunday. Rockwell probably only submitted works to this smaller magazine after the publishers of the larger magazines had declined to publish the illustration. This cover is a very rare hard-to-find paper collectible. I have seen it on eBay only once. The starting bid was $150.00. I did not win the item. The winner was kind enough to give me a scan of the cover and allow me to show it to you. The picture is one of those common recurring themes that Rockwell loved to paint. A boy notices his chance for mischief, good-natured, of course. He follows through on that chance and gets his desired reaction. This boy sees a lady step up onto a coin-operated scale. She has been carrying golf clubs and a tennis racket along with her regular luggage. She deposits her coin into the scale. Before her weight registers, the boy adds a portion of his weight to the scale. He pushes the platform with his foot. The lady has no idea that she weighs so much. She even drops her purse in surprise. She exclaims "Good Land!" Now for the naughty boy's dilemma, does he confess the trick he has played? Or does he play along and tell the lady that she carries all that weight well? Rockwell wisely leaves those details to our imaginations .